Dinan is listed Ville d'Art et d'Histoire. The medieval city has indeed retained most of its fortifications and is a true gateway to history. Built on a hill overlooking the Rance Valley, it has always been an important crossroads. It started as a Gallic oppidum, became a Roman camp, a stronghold nestled behind thick wooden palisades then a magnificent walled city protected by the massive ramparts we can see today. Amazingly, the Lords of Brittany were the vassals of the Lords of Normandy. In 1065 Conan, Count of Brittany, rebelled against William the Conqueror who besieged and captured the stronghold. A panel of the Bayeux Tapestry represents the episode where Conan presents the keys of Dinan to William. 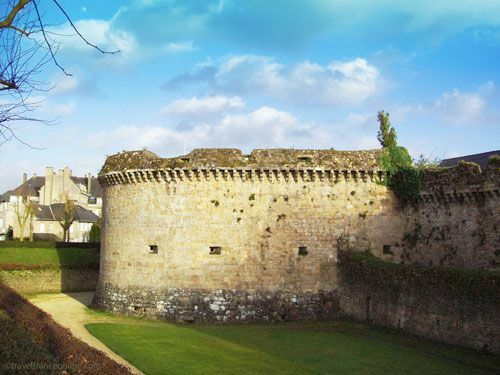 Dinan became a Duchy in 1283 and upgraded its defense system. The fortifications were once more improved during the War of the Breton Succession of 1341-1364 and the Hundred Years War. The masterpiece of these fortifications is the Donjon or Château de Dinan. Duke John IV of Brittany built the dungeon in 1380; the chapel and the Tour de Coetquen date from 1450. The 13th century Porte du Guichet accesses them. The former chapel of the Dukes of Brittany today exhibits objects coming from local religious establishments. Among these are a splendid Renaissance retable and a wooden statue of a monk from the nearby Abbey of Beaulieu. There is also a 16th century polychrome wooden statue of St. Barbe, the patron saint of miners and bomb disposal experts. The Dukes of Brittany attended the office from the private loggia where their richly carved stone chair and fireplace are still visible. Both the Dungeon and the Tour de Coetquen, once served as jail, but now house the Musée d'Histoire de la Ville de Dinan. The museum chronicles the evolution of the city from prehistoric times to the early 20th century. A beautiful lead reliquary dating from 1557 is among the medieval objects exhibited in the dungeon. 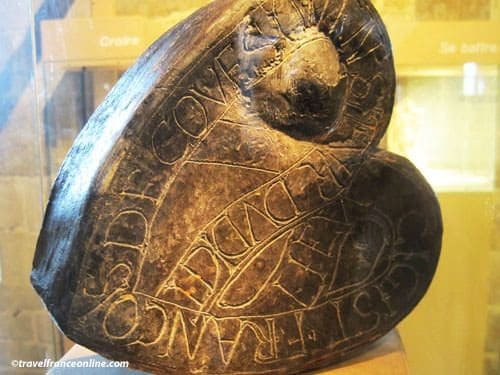 It contains the heart of Lord Francois Coetquen (whose son restored the fortifications). The top hall is an exhibition hall dedicated to local painters and sculptors whose art work is related to Dinan and its region. If you don't suffer from vertigo, I recommend you go up to the Dungeon top platform as it boasts prime views of the city and its surrounding countryside. The first floor of Tour de Coetquen is an exhibition hall for old photos of Dinan. The old guard room in the lower part was converted into a crypt where you'll see an impressive series of recumbent statues. The 2700m long ramparts, 14 guard towers (10 are left), 4 massive gates and the castle once protected the medieval citadel that spread over 30 hectares. The ramparts were erected in the 13th century when Dinan became a duchy. However, they were continually improved until the Wars of Religion of the 16th century, but then became redundant. A circular walk (free access) - Promenade des Petits Fossés - and is the best way to discover the city and its fortifications. The ramparts of Dinan are listed Historical Monuments. The Porte du Guichet, the current entrance to the Château of Dinan is located in Rue du Château. The 12th century Porte St-Louis is located 50m farther down the road. 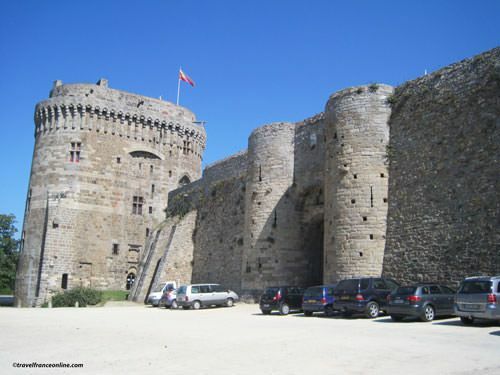 Walk under the gate and once on Place du Duc Jean IV you have prime views of the Dungeon and Tour de Coetquen. 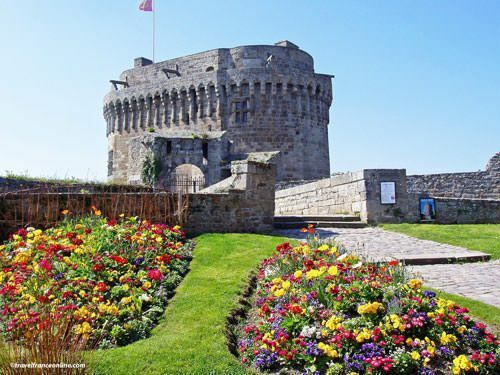 The Tour du Connétable and Tour de Beaufort are farther along, between the castle and Place Duclos, by the site of the former Porte de Brest. The ruined gate and a whole section of rampart were indeed pulled down in 1881; cobble stones now mark their layout. Follow Rue Thiers where you find the next section of rampart; the moat has left place to an open-air car park. The Tour Julien is located by Place du Général Leclerc and is the 1st tower on the northern fortifications. 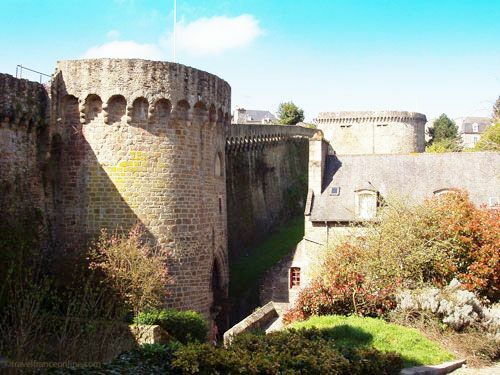 You then come across the 15th century Tour de Lesquen, Tour de Beaumanoir and the 13th century Porte St-Malo which accesses the old Chemin de Ronde. This walkway leads to the Tour du Gouverneur and the Porte Jerzual. The section of rampart beyond the Porte du Jerzual is partly destroyed. You therefore have to follow Rue du Rempart in order to reach the next tower. The 13th century Porte Ste-Catherine and 14th century Poterne du Cardinal are located in the northern corner of the Jardin Anglais. This public garden boasts prime views over the viaduct and the Port of Lanvallay 74m below. It also links to the walk Promenade de la Duchesse Anne which ends in Rue Victor Basch. Once there, turn right in Rue Waldeck Rousseau and right again in Rue du Général de Gaulle in order to find the last section of the rampart. 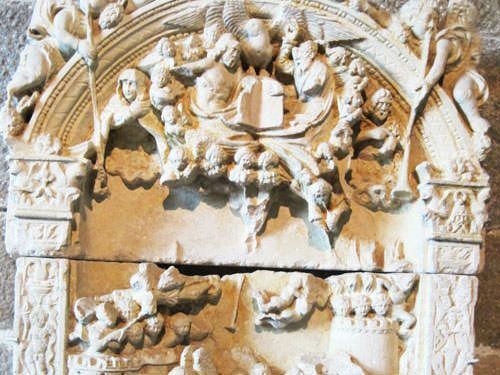 The ruined Tour du Sillon and Tour Longue and the 15th century Tour de Penthièvre were recently restored. Another 50m and you are back at Porte St-Louis!